PMT Digital offer a wide range on external banner stands and outdoor banners suitable for outdoor exhibitions. Using UV or solvent print technologies, banner stands are completely waterproof and have a lightfast capability to last for many years. 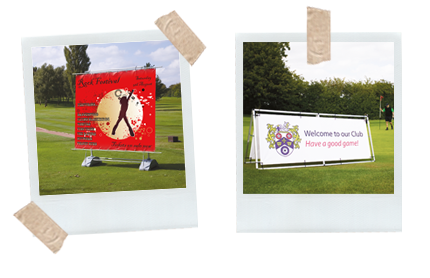 All of our outdoor banner stands have a heavyweight base which can be filled with sand or water to insure stability in mild windy conditions. We traditionally print on a heavyweight PVC for added durability and comes with an optional heavy duty carry bag for easy transportation. The Blizzard banner stand and the Horizon banner stand are our most popular stands used in high traffic areas and are easily transportable from one place to another. The Monsoon system is used to hold PVC banners and can be displayed from both sides. Other recognised brands PMT Digital supply are the Storm Hydro 2 banner stand, the Vista outdoor banner stand, the Mistral outdoor banner system, the Typhoon outdoor banner system, plus many more.